With Automator actions and support for AppleScript commands, Apple Remote Desktop gives you the ability to create custom workflows designed to make your life easier. 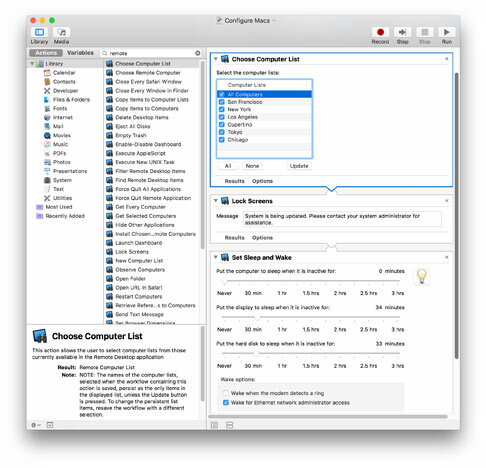 Apple Remote Desktop takes advantage of Automator, with more than 40 sample Automator actions that help you accomplish time-consuming, repetitive tasks quickly and easily. You can also create your own custom workflows by linking together individual actions. Save these workflows as self-running applications  or as plug-ins that can be used whenever you need them. For example, you might find that you regularly need to configure a group of systems all at once: setting a corporate desktop, setting Finder preferences, changing the time zone and so on. By creating and saving a plug-in that accomplishes all those tasks exactly the same way each time, you can be ready whenever you need to configure a new system. The Automator actions in Apple Remote Desktop provide you with a basic toolkit you can customise to your needs. They make it easy to accomplish tasks such as ejecting all disks, emptying the Trash, restarting computers, enabling or disabling Dashboard, hiding other applications and executing AppleScript scripts. And these time-saving actions arent limited to just administrators. These workflows can be shared with anyone in your organisation with an Apple Remote Desktop licence. In schools, for instance, teachers can use Automator actions to lock screens or set the desktop picture, without needing to know anything about Apple Remote Desktop. This helps ensure consistent system administration standards across your organisation. If youre always doing the same things, stop right now  and let Automator take over the tedium.